Eclecticism is undoubtedly the outstanding feature of Mondomarine, a yard which right from its inception got into all aspects of pleasure craft shipyard work: building luxury boats and ships, hulls in composite and in metal - which is to say steel and/or aluminium - but also carrying out very fine refits such as for Over the Rainbow (formerly Classique), a 34 metre wooden motoryacht built in 1930 by Dickie & Sons in Bangor, Wales. full load displacement 351 t.
This unique aspect of the yard has also been confirmed by the typologies of vessels launched over the years and will be further conformed by the ones we'll soon be seeing at sea: planing hulls, displacement and semi-displacement boats, fast flying bridge motoryachts, comfortable little ships, elegant superyachts, functional explorers etc.. All in all, a heterogeneous kaleidoscope of proposals for every yachting enthusiast. 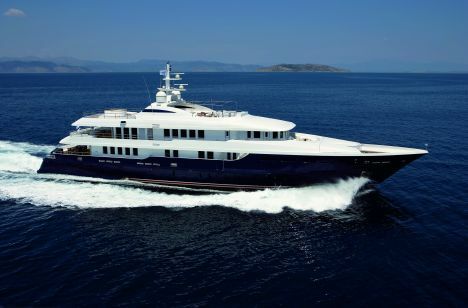 ÒCeanos, launched this year and sailing in these pages, is a semi-displacement all aluminium vessel that represents a sort of link between these two souls that make this yard so extremely vital. 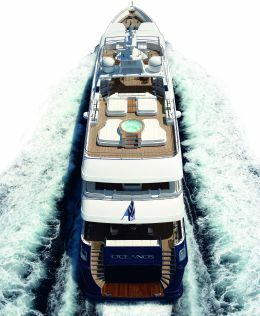 ÒCeanos, touching on 50 metres LOA, certification RINA Croce di Malta 100-A1.1 "Y", Charter Class, is in fact the result of an intervention regarding lengthening, transformation and refit carried out by Mondomarine on a vessel owned by the Greek shipowners Golden Yacht, built to a Hydro Tech design but almost three metres shorter. 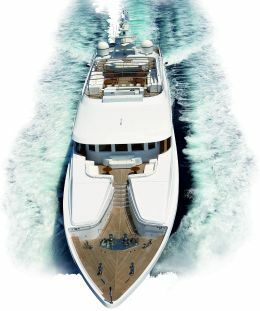 The unusually designed hull is equipped with a tunnel for the propellers, and manages to combine all the special elements of a displacement vessel, especially in virtue of its low consumption and consequently long range, with excellent performances - 18 knots maximum and 16.5 cruising speed - that are a result of the significant fineness of its forms. Obviously the lengthening intervention was preceded a phase of in-depth analysis, carried out by the SYDAC of Genoa, who evaluated and brilliantly solved all the complex problems linked to the structures and to the hydrodynamics of the quickwork, adapting the hull to the necessities imposed by new external forms and internal layouts, both the work of designer Giorgio Vafiadis. 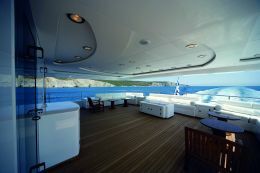 Though ÒCeanos is a vessel declaredly aimed at charter, you get quite a different sensation on going aboard. This is because Vafiadis has laudably created environments that are always spacious - a sensation emphasised by the abundance of natural light from the large windowed areas - and share a high level of comfort. On this subject it should be underlined that ÒCeanos has floating floors and ceilings, which drastically reduce noise and vibrations, and possesses above all a personal style enhanced by furnishings and fittings capable of giving character to each individual environment. 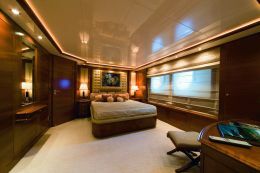 We begin our visit forward on the main deck where the guest zone consists of two distinct cabins, one with double bed and Madrona woodwork and the other with twin beds, in cherry and iridescent mahogany. 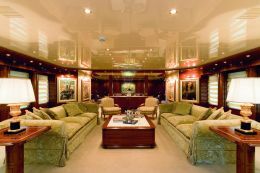 If necessary the two cabins can be used as one large VIP suite, suitable for a family with children. The other guest cabins are on the lower deck. 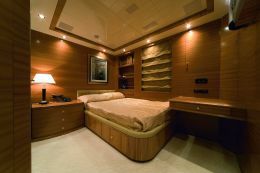 Two, this time in whitened oak, have twin beds plus a foldaway, while the other two, where the main wood is cherry, have double beds and VIP space. The bathrooms are very roomy in all cabins, done in with different woods to create an evocative chromatic play and enriched by mosaics, marble and precious furnishing accessories. 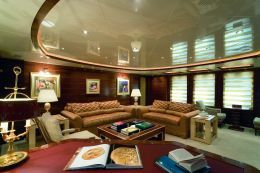 The owner's area takes up two thirds of the upper deck (the rest being occupied by the large pilothouse) and it consists of a big panoramic view saloon amidships which can also be used as a private office or an entertainment area available to guests. 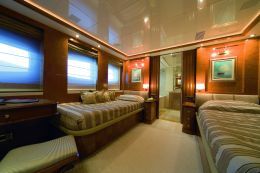 The suite is aft and accessed by way of a landing. Vafiadis' designer's eye in this case focused on giving the owner a superb view of the sea on three sides, a view that may be enjoyed directly from the large double bed. This was made possible by slightly raising the height of the bed, by the adoption of almost full length windows, but also by keeping the bulwarks low and suitably shaped. The external part of the deck, again aft, is perfectly made to be enjoyed. Accessible directly from the suite, it is a very private zone exclusively for the owner's use. From here and from the main deck you can access the sundeck directly by means of external stairways: a very large area, well equipped to accommodate all the needs of open air life. Well structured for holding parties, it has four extendable tables that can seat up to 24, while farther aft there are three great sun beds set around a circular Jacuzzi. 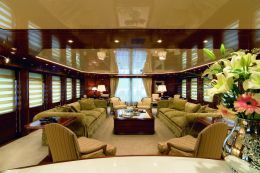 Going back to the main deck, the saloon features a central living area gathered around a not too low table, and facing sofas and armchairs to comfortably seat 12. 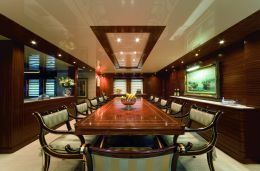 The adjacent dining room forward, with a large, rectangular table and small armchair seating, has the same capacity and is completely separated from the saloon by sliding doors. The crew's quarters, which gained most from the lengthening of the hull, are on the lower deck. As well as comfortable cabins and a spacious service dinette, there is a large professional galley with separate areas for cooking and preparation.